The Scotland trail is located in the Grand Mesa National Forest north of Cedaredge, Colorado. 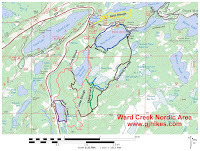 The trail is on the west side of Highway 65 across from the Ward Lake Nordic Area and Ward Creek Reservoir. Unlike the well groomed and well used trails in the Skyway, County Line and Ward Creek Nordic Areas that draw hundreds of visitors throughout the snowy winter months the Scotland trail is much more quiet and primitive. 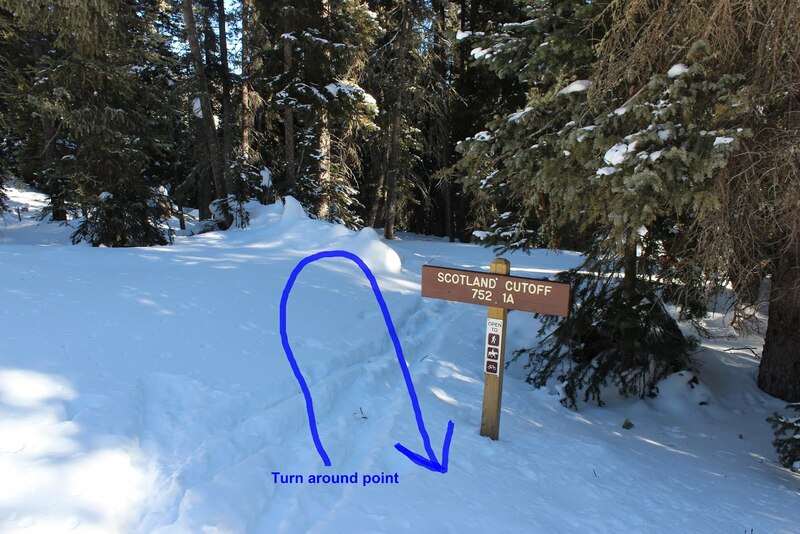 The Scotland trailhead is right on the road shoulder of Highway 65 and that easy access makes it a good candidate for Nordic activities. 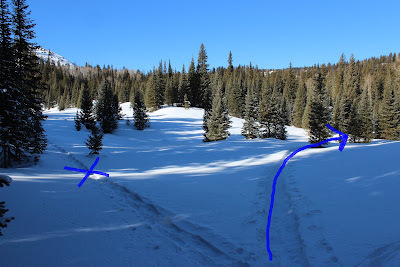 The area around the trailhead can have tracks from people that have come up just to play in the snow that lead off in almost every direction. The Scotland trail starts out heading north somewhat parallel to the highway. There are several mylar trail markers that show the route to take but after the snow gets to about 5 feet deep the markers disappear. The Scotland trail is a multi-use trail that is open to hiking, horseback riding and ATV's during the summer months. With that in mind it becomes easier to stay on the trail if you happen to be the first person there after a good snow storm. If you aren't following a well established path that is at least 4 feet wide then you might be straying from the correct route. A GPS comes in handy for this type of outing. 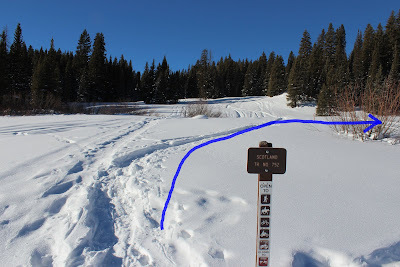 Unfortunately people have gotten lost while snowshoeing on the Grand Mesa and died of exposure. Even on a clear day the wind can kick up and blow over your tracks making it next to impossible to retrace your steps back to the trailhead. That isn't as likely to happen in the thickly wooded area of the Scotland trail other than in a few clearings. People seem to wander around off the trail a lot in this area so you may end up following their tracks in the wrong direction. The Scotland trail is much more peaceful than other areas on the Grand Mesa where crowds flock to the easier groomed trails. The highest point on the trail is just under 3/4 of a mile from the trailhead. The trail crosses a ridge where you can look down at the frozen Ward Creek Reservoir. The forest opens up a bit with a good view of Scotland Peak a little off to the west. In this picture you can see tracks heading off in that direction toward the peak and the Granby Reservoirs. To continue following this post stay to the right at this point and continue around the cut in the side of the hill. A careful examination of the contour of the snow should reveal the path of the road that is hidden beneath the snow. As you can see from the picture we are breaking a fresh trail from this point on. The trees are thick enough that it isn't too hard to pick out the broad trail even with all of the snow cover. The turn around point for this post was at the junction of the Scotland Cutoff trail. Continuing down the cutoff trail will lead you past the sledding hill that is across Highway 65 from Ward Creek Reservoir. 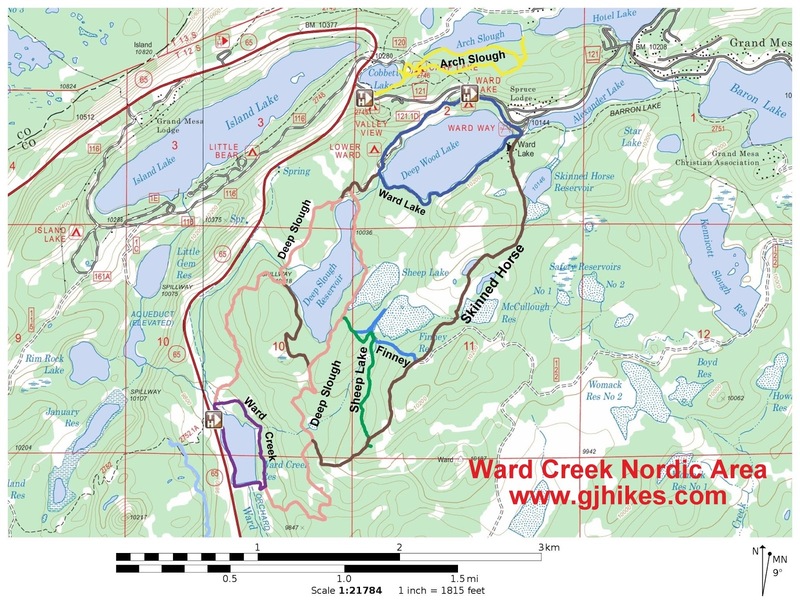 It is possible to continue along the Scotland trail past January Reservoir where you will come to a Forest Service Road that leads up to Island Lake or over toward the Granby's and all points beyond. Snowshoeing is the most difficult form of exercise when compared to hiking, running and cross country skiing. If you aren't in very good shape your legs can cramp up from the exertion and leave you in a pickle with no easy way to recover except a good rest. Porcupines can be somewhat fun to watch. Most people are under the impression that porcupines can throw their quills for protection but that isn't the case at all. When they feel threatened their hair bristles up like in this picture. If you get too close they can quickly back into you and stick you with some of their quills that easily detach. And just as easily you can get a nasty infection not to mention the pain of trying to extract the little barbed quills. Highway 65 on the south side of the Grand Mesa usually melts off before the route up the north side does. If you are coming from Grand Junction after a fresh snow you might consider driving to Delta and come up the south side. That is especially the case if you are driving a 2-wheel drive vehicle. There is an old vault toilet just up the road at the Ward Creek Reservoir but it is usually pretty disgusting. Other than hiding in the bushes a better alternative is to drive on up to the Grand Mesa Visitor Center where they have nice heated restrooms with flush toilets that are open 24 hour a day. The Scotland trail awaits all those that want to get away from the crowds and maybe even make their own trail through the pristine snow. If you would like to see it for yourself then all you have to do is 'Take a hike'.